First, I’ll go over a little background information about music streaming and promotion, and then share the details of my own personal experience. Below, I’ll share what’s working for me (and what’s not) as a singer-songwriter trying to grow my listener base. A September 2018 article by Parker Hall in Digital Trends says that Spotify has 30 million songs in its catalogue, adding 20,000 new songs each day. Yes, twenty-thousand. Each day. Mind boggling, right? That’s one little bottle with our message, floating in an ocean so vast it’s hard to comprehend. Will the currents wash it ashore to a curious stranger? Maybe, or maybe not. However, current trends in overall music consumption justify some reason for optimism. According to Nielson Music’s Mid-Year Music Report U.S. from July 2018, people are listening to more music. On-demand audio streaming is up a healthy 45% from 2017. Additionally, a more broad-scope music industry measure, “total album equivalent consumption,” is up 18.4% from the previous year. This figure, TEA, includes albums, streaming and on demand audio and video, but excludes broadcast and digital radio plays. 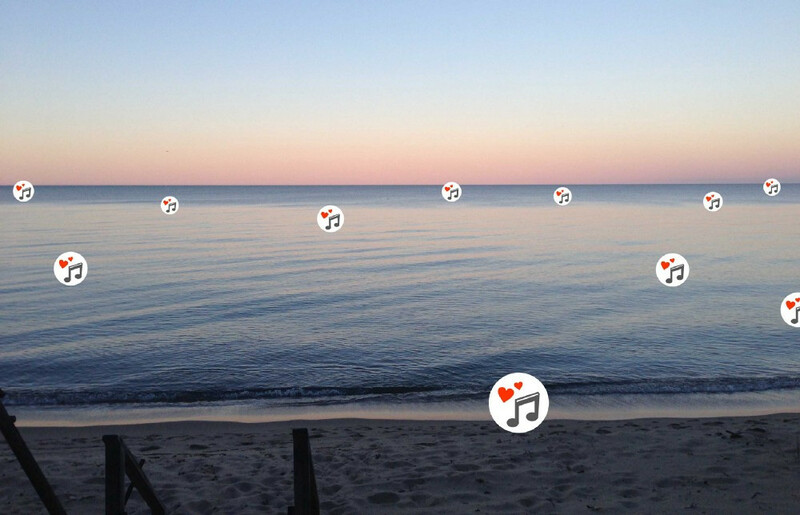 So, it’s clear that there’s a whole lot of music out there, but there are a lot of people listening to it. How do labels release new music? As an independent artist, I’ve decided it’s a good idea to study what established, successful record labels do, and emulate it to the best of my ability. What’s the biggest thing I’ve discovered that major labels do differently than most independent artists? Promotion. Record labels generally spend more on promotion than they do on music production. That’s not to say they cheap out on production; they don’t. They just spend a whole lot of money promoting their artists. This is not to suggest that people simply throw as much money as possible at music promoters. There are plenty of unscrupulous sharks out there, and the music has to be top notch in order to justify our personal financial investment into such a competitive environment as music. My own experience seems to support the labels’ methods. Through trial and error, I’ve come to the conclusion that simply releasing music and hoping people find it is a recipe for failure. Touring can be helpful, but not enough to REALLY catch on in the streaming space. Therefore, promotion is vital. Getting music out there on a broader scale can be done in many ways, including relationships with influencers like music industry execs, playlist curators, and sync music supervisors. Those can be free. However, most of us don’t have the opportunity of frequently rubbing shoulders with the movers and shakers of the music industry. Many of us do not get replies to our carefully worded emails to these influencers. It’s true, a fortunate few reach the masses by effortlessly getting discovered and embraced by the right people. But the rest of us need to simply accept the fact that we have to become a student of music promotion in order to get heard, and dedicate a budget for it. If we truly believe that our music would be loved by large amounts of people if they could only hear it for themselves, then we have to spend money to get our music in the spaces where it can be discovered, saved, and shared in the most popular music platform today: streaming. Following, I’ll share my own experience with promotion results of my most recent single releases. I’ve found that results vary, and different promoters focus on different things. Some focus on broadcast or streaming promotion, and others may focus more on general press and PR. With regard to getting press coverage, I had great luck with Independent Music Promotion. They were able to get several articles and reviews of my single, including this one on the heavily trafficked website, The Celebrity Cafe, and this one on music industry site, The Nashville Music Guide. I tried two different companies for Spotify playlist promotion, and the results surprised me. The first one pitched my first single, "Hidden Wings", to Spotify playlist curators. This promotion company has an approach that’s somewhat personal, pitching to only large playlists with over 10K listeners, and working from industry relationships. Their rate for a 6-week campaign was fairly substantial. The second company I worked with for Spotify promotion was an indie-friendly playlist pitching company called Playlist Push. I signed up for a 2-week campaign to promote a follow-up single called "Beautiful Truth”. Their service is more of a “system” than a traditional promoter or publicist. Playlist Push connects artists’ music to playlisters with followings, who in turn get paid to listen and consider new songs to add. It’s beneficial for both artists and playlist curators. I was interested in trying it because Playlist Push’s rate for the standard short campaign was more affordable than the traditional relationship-based promoters who operate similar to traditional salespeople, and pitch as part of longer campaigns. Next, I’ll examine my results a couple weeks after both campaigns ended. Long story short, my results from Playlist Push seem to be better. I’ll explain why with my Spotify Artist stats (see Fig. 1 & 2 below). 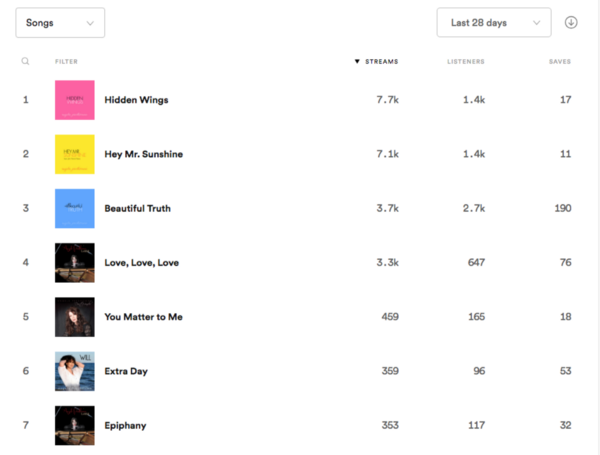 At first glance, it looks like “Hidden Wings” did better than “Beautiful Truth” in this 28-day period, getting more streams. But it’s not that simple. Take a look at the listener count and the saves. “Beautiful Truth” was heard by twice as many people, and was saved by 11x more people. The number of saves per listener is much higher with “Beautiful Truth.” It’s true that “Hidden Wings” will generate more micro-pennies for me as an artist in the short term, but what happens when the playlist curators remove the song from their lists? The key for long term growth is not the play count (streams) in this limited period, but instead, that people like a song enough to save it and add it to their own personal collections on Spotify. Then, when the campaigns are long over, the song is still being played and gaining traction organically. Better yet, if Spotify listeners follow the artist from the artist profile page, they are notified when that artist releases a new track. Numbers of listeners, saves, and follows are crucial when it comes to building real growth over time. 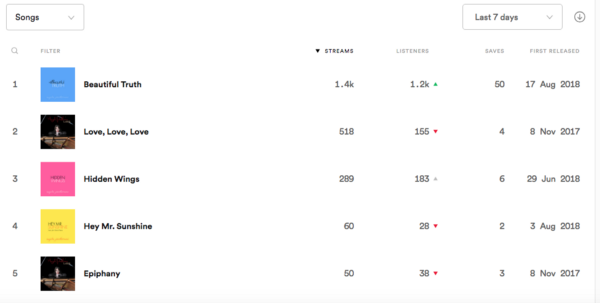 The ratio of saves to listeners in both periods is significantly higher with “Beautiful Truth,” the song that I spent far less to promote with Playlist Push’s simple, but apparently effective system. The science aficionados out there might be saying, “But wait, that’s not a controlled experiment! Those are different songs. Maybe one is just way better than the other one, and therefore was better received by Spotify listeners.” That’s possible. However, I did my own informal, small-scale market research survey with a trusted circle of music listeners before I chose which single to release first and which to invest more in. More people I asked thought that “Hidden Wings” was a stronger song, with greater potential to get traction in the streaming space. I agreed. Both are positive, inspirational songs. “Beautiful Truth” has its own merit, but “Hidden Wings” has a Sam Smith vibe to it, and Sam Smith’s sound has been shown to be commercially viable in today’s market. It’s not all hip hop and EDM. There’s room for us mellow, crooning singer-songwriters, too. So, looking at these results just weeks after the Spotify promotional campaigns ended for these two singles, I can say that the outcome is exactly the opposite of what I had expected. The less expensive, less traditional playlist pitching company, Playlist Push, has yielded better results for my music thus far. The other songs you’ll see in my stats have their own histories and unique stories. “Love Love Love” has a comparable amount of streams because it’s slowly gained traction over time (first released in 2013), and is finding success through the music licensing agency Audiosparx on their 3rd party streaming compilations. “Hey Mr. Sunshine” was my second single release in 2018, and it found its way temporarily onto a few new indie release playlists. However, it never received the higher save ratio that the “Beautiful Truth” promotion yielded. Lastly, the ballad “Epiphany” was featured on an episode of the popular TV show “Dance Moms” a few years ago, and has enjoyed modest but steady organic, grassroots growth ever since. All in all, it seems that some of the several thousand bottled messages that are thrown out to sea each day will find a home, while others will sink into obscurity. Sometimes a song just doesn’t resonate with people. But as artists who truly believe in our work, we’ll never know if our songs will be embraced until they get heard by a critical mass that’s open to new music, and is waiting to be moved by the next great song. Check out more laid-back, soulful, feel-good music by Angela Predhomme. Follow to hear about new song releases! NOTE: I wrote this piece in order to share my experience that could benefit others, and I was not hired to write this article by any company mentioned in it." +Spotify or Physical CD's: What's Better for the music creators?